Showing 10 articles from December 27, 2017. The annual First Day Hike will take place Monday, Jan. 1, 2018 at Lake Sylvia State Park and sponsored by Friends of Schafer and Lake Sylvia State Parks (FOSLS) and the Washington State Parks Staff. Lake Sylvia State Park is located in Montesano. Follow 3rd Street north into the park. Ranger Miles Wnzel will lead a 2 mile hike along the loop around Lake Sylvia. There will also be a shorter stroll led by a volunteer from FOSLS. Meet at the kitchen area at 12:45 p.m. and dress appropriately as we hike whatever the weather. There will be hot drinks and cookies provided by the Friends group at the kitchen after the hike. This is a Free Day at the State Parks, you do not need a Discover Pass. Well mannered dogs on a short leash are welcome. No bikes please. For more information call Ranger Miles Wenzel at (360) 249-3621 or Stet Palmer at (360) 789-9953. The Pacific Transit System will hold its regular first 2018 quarterly board meeting on Thursday, Jan. 11, 2018 at the Pacific County Office Building's Meeting Room at 7013 Sandridge Road, Long Beach at 10:30 a.m. The public is invited to come to be heard. What's the best way to distribute my personal possessions to my kids after I'm gone without causing hard feelings or conflict? I have a lot of jewelry, art, family heirlooms and antique furniture, and three grown kids that don't always see eye-to-eye on things. For many, "once upon a time" is not something they like to think about. They're too busy looking ahead. And for some, "happily ever after" is still too far in the future to accept as reality. When you need an electrician it is always nice to have one that is local and nearby. 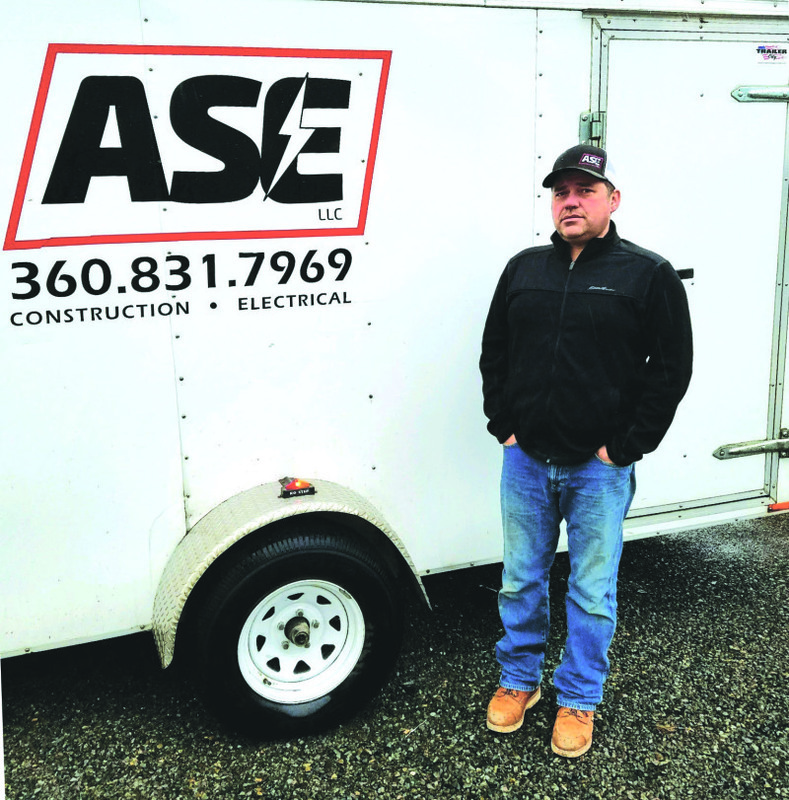 Art Halberg of ASE, LLC is a licensed and bonded Electrician newer to the area. He moved to the Toledo area about 1 1/2 year ago and he is a great addition to the community. Sandy Miller Brusco donated a new and improved reader board for the Toledo High School. "The current sign is showing its age," stated Toledo High School Principal Martin Huffman. "The new sign will be easier to read and easier to update." Mrs. Brusco is the widow of Gene Miller, a Toledo resident and volunteer and retired teacher and coach, Primo Brusco. His first teaching job was in 1950 at Toledo High School. Primo coached sports, and was a coach of several district champions. He often contributed to the Toledo community and was involved in the Elks, American Legion, Ocean Park Volunteer Firefighters, and the Toledo Historical Society. 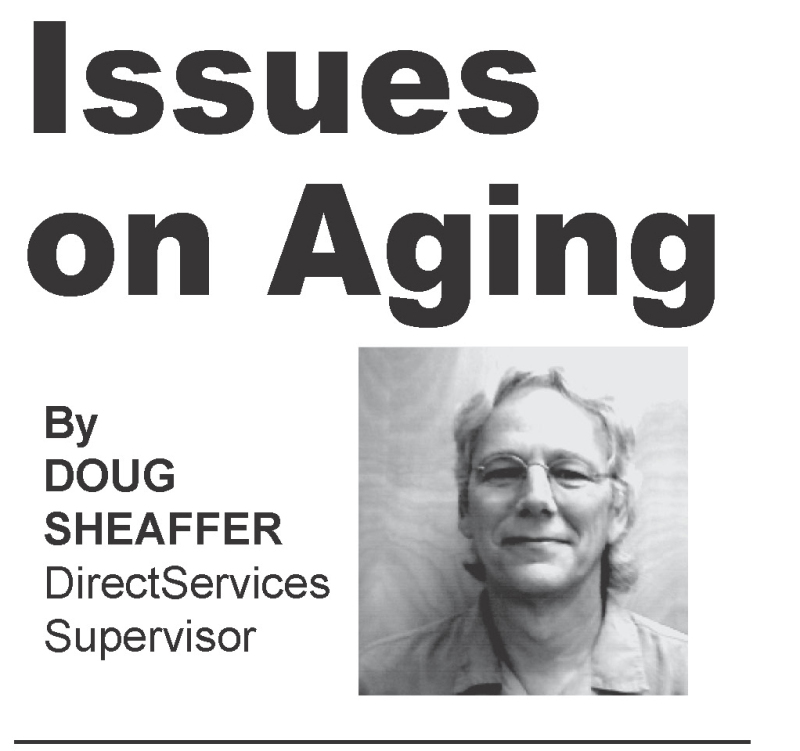 He retired in 1977, ending as a superintendent of Stevedore (CO) School District. 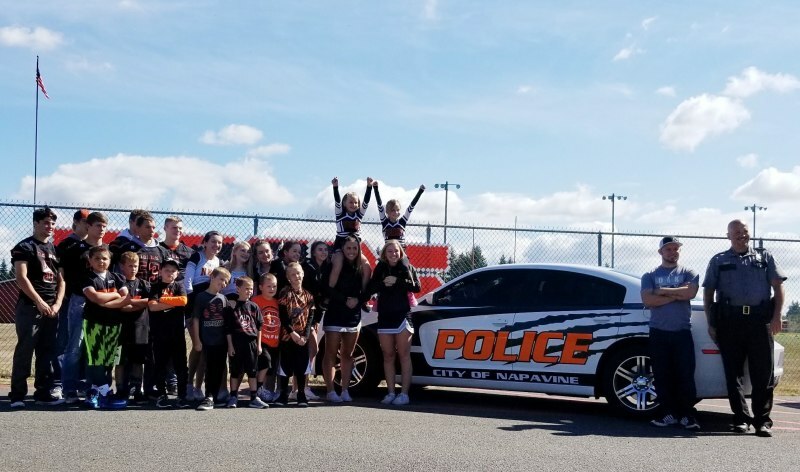 Napavine students along with Chief Salyers posing with the newly painted squad car using school colors. Napavine is a city that sits on the hill. It's a city that has seen a lot of changes in their city government this past year but one thing has stayed the same, Napavine Chief of Police Chris Salyers. 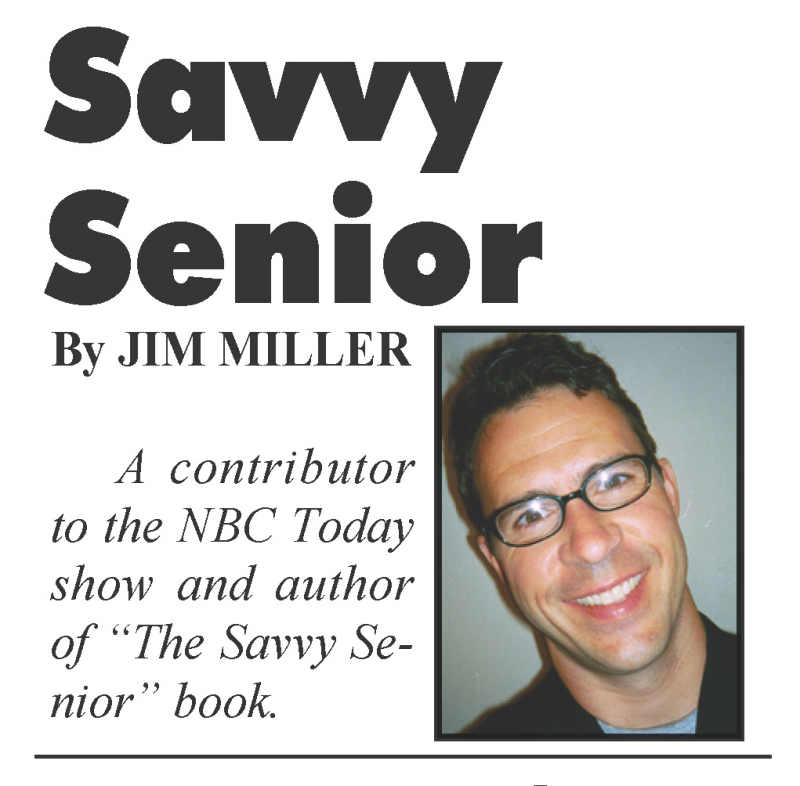 Chief Salyers is all about community and you can tell he enjoys his job, working tirelessly for the Napavine. One of the officers shot and injured in the police-involved-shooting that left the suspect dead in Bremerton on Dec. 17 formerly served with the South Bend Police Department. 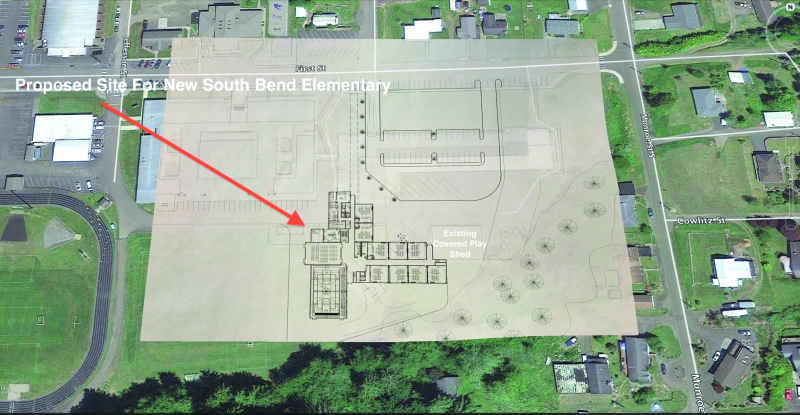 The South Bend School District has a unique opportunity to fund well over three quarters of the $16,500,000 proposed cost for a new elementary school. All that is standing in the way is the state's capital budget and two bills that have been presented in the state senate: SB 5453 and HB 1193. Using a balanced attack, Willapa Valley kayoed Chief Leschi 60-21 at Puyallup Thursday night. Cameron Swartz scored 11 points and Emilee Layman added 10 for the Vikings. Hannah Cook and Brooke Friese popped in 9 points each for WVHS, now 6-2 overall and 5-2 in the Pacific League.